On July 3, 2013, three sisters made their final profession. 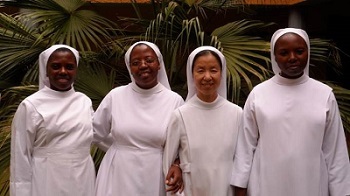 (from left) Sr. Julia Haule, Sr. Judith Kombe and Sr. Immaculata Mgeni are pictured here with their directress, Sr. Serapha Jeong (second from the right). We thank God for this great blessing and joy in our priory.